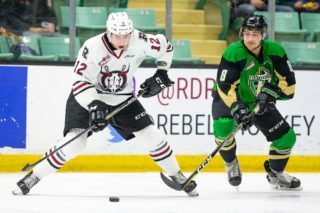 These are heady times for Ethan Anders and his Red Deer Rebels teammates. 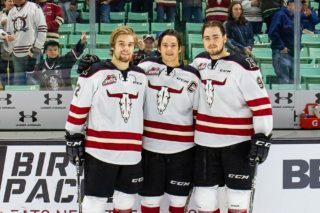 The Rebels occupy top spot in the Western Hockey League Central Division with an 11-4-1-0 record, are 7-2-1-0 in their last 10 outings and last week were 10th in the CHL Top 10 rankings. 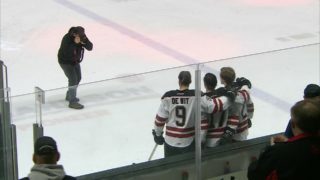 Then, on Monday, Anders was honoured as the WHL goaltender of the week coming off Saturday’s sizzling 34-save shutout of the host Calgary Hitmen. “It’s been a good start to the year for both myself and the team,” Anders said Monday. “It’s good for us to get recognized and good for us to be out there and on top of the division. Team accolades aside, Anders has been one of the team’s most valuable players this season and if that award was handed out tomorrow, he’d be one of the three finalists, along with defenceman Alex Alexeyev and high scoring forward Brandon Hagel. The Regina native sports a 2.85 goals-against average and his impressive .922 save percentage is third among WHL goalies who have played as many or more than Anders’ 843 minutes. Anders enjoyed a successful 2017-18 rookie season, posting a 3.09 GAA and .905 save percentage and has clearly avoided the dreaded ‘sophomore slump’ this fall. 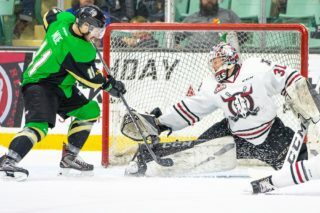 The Rebels’ defensive corps is a team strength and a major aid to Anders this season, and the 18-year-old also gives credit to first-year goalie coach Kraymer Barnstable. “Kraymer has been really good. We’ve been working on lots of things,” said Anders. “He sees things in games that he likes and other things that he doesn’t like and we’ll work on those in practice. “If he sees me slacking in practice he’ll make sure I stay on top of it and make sure I always compete and work in practice so that will transfer over to games. Anders’ work hasn’t gone unnoticed by pro scouts, with Central Scouting recently identifying him as a ‘C’ prospect — a prospective fourth- to sixth-round pick — for the 2019 NHL entry draft. 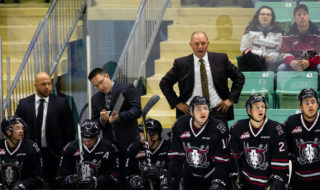 First and foremost, of course, Anders is focused in on overall team success and he has his theories as to why the Rebels have been a hit over the first six weeks of the season when it originally appeared that they would struggle offensively. “We did think offence would be a bit of a struggle this year but everyone has been contributing,” said Anders. “Alex Alexeyev has been awesome and that top line of Hagel, (Jeff) de Wit and Johny (Reese Johnson, who filled in for an injured but now healthy Oleg Zaytsev) has been amazing. The Rebels will head east on Wednesday for games Friday, Saturday and Sunday in Brandon, Moose Jaw and Swift Current.